Quote from ColeusRattus : Looks great! But is the lighting dynamic or pre-baked? The former would finally allow for day/night cyclesa and dynamic headlights, while the latter has clear performance advantages. It's fully dynamic now. We lost global illumination but we've progressed towards night/day cycle. Btw you can combine baked lighting with dynamic headlights, since light is additive. Quote : Cascades are the separate shadow maps drawn over increasingly large areas (at lower resolution) as you move away from the view point. The correct cascade is selected for each pixel to decide if it is in shadow or lit by the sun. This implies to me it's dynamic, but then again its only my word on it. Quote from mbutcher : Scawen has mentioned that all of the current tracks will need at least a basic level of remodelling. There have already been photos posted of new SO lighting (specifically, shadows) but so far no remodelling. I'm confident it's on their to do list though. That i know that all Tracks gets this "Graphics Update" but i mean the remodeling There are so many possible Roads you can Drive in SO and i hope they will any time. Great update, thanks for sharing!!! In my opinion, once the cars have the same level of detail, LFS will be on par with other current gen SIMs (only talking about visuals here). I really like what Eric is doing to the tracks. Looking forward to try LFS again on the future when those GFX updates are done. maybe its a bigger map? Quote from ThunderX86 : Just beautiful. Looks incredible! Looking forward to the release! Last edited by Rory2000, Mon, 27 Aug 2018 15:26 . This won't happen for a long time but this is the wrong thread for this. However, as long as the original content is fun and looks good, it's not THAT necessary. So little things done yet so much improvements to the visuals, well done devs, cannot wait for the release! Quote from Scawen : Yes, Aston has been raised to fix the area that was below sea level. I think it is 2 metres, so to make accurate comparison shots you can subtract 131072 from the Z coordinate (3rd number) in the /cp line. Why do you need objects to sink into the ground on AU? Just curious. Quote from Eric : Why do you need objects to sink into the ground on AU? Just curious. Just brought a tear into my eye of how beautiful everything looks now. I love this image particularly The specular effets look amazing! Would that problem be solved if one of the 3d kerb objects (e.g. from Blackwood) was included as a layout object? EDIT: I guess not - looking at your pictures, there are a lot of reasons to put concrete objects slightly underground. Last edited by Scawen, Tue, 28 Aug 2018 06:58 . A 3D Kerb object in the editor would help massively, will enable turns to be done smoother and kerbs to be placed more accurately. Although it doesn"t resolve all the purposes of putting underground concrete parts, it does solve the majority of issues regarding "Ramp kerbs". Quote from Scawen : Would that problem be solved if one of the 3d kerb objects (e.g. from Blackwood) was included as a layout object? Impressive! Scawen that's an amazing job on the graphics, finally Aston gets a facelift. Are you able to hint whether a new track is in the works for the near future? Will we be able to transfer the track file and placement direct into the new environment? Or will it be another Blackwood situation where the coords will be different in placement? Please can you not spam repeats of questions? If everyone kept repeating their questions over and over if we don't reply quickly then the thread would be an endless loop of repeated questions. I've just had a day off after doing loads of work every day recently. I think most of the questions in the thread have been answered by other readers. Quote from nacim : So Scawen, your technical description is still a bit vague for me.. you used a specular workflow right ? I can't see any metallic surface on theses screenshots, does Eric has a control on the specular color per pixel ? Usually the specular reflections are not coloured. So I suppose that is a specular workflow though I'm not really sure about the terminology. Currently we do not have control of specular colour per pixel. A specular colour can be set for a whole surface and that can be used for a metallic effect (or another kind of coloured reflection, for example a window covered with a film of coloured transparent plastic). I'm not really sure what a specular factor or a specular power is, but the BRDF naturally reduces the brightness of the shine and increases the spread if the roughness is increased. Our shaders are using an approximation to a Cook Torrance BRDF with optimisations discussed by various authors. After quite a bit of experimentation we came to one that Eric was happy with and felt he had enough control over to get most of the effects he needed. Quote from nacim : Oh and I remember you talked about exponential fog one day, is implemented or still on your backlog ? I was forced to implement fog in the shaders when I needed to move to shader model 3 and it doesn't do fog otherwise. So I went for exponential fog. It's nice because it allows fog to have some effect in the middle distance without reducing far distance pixels to 100% fog colour. Will I be able to transfer the track file and placement direct into the new environment? Or will it be another Blackwood situation where the coords will be different? 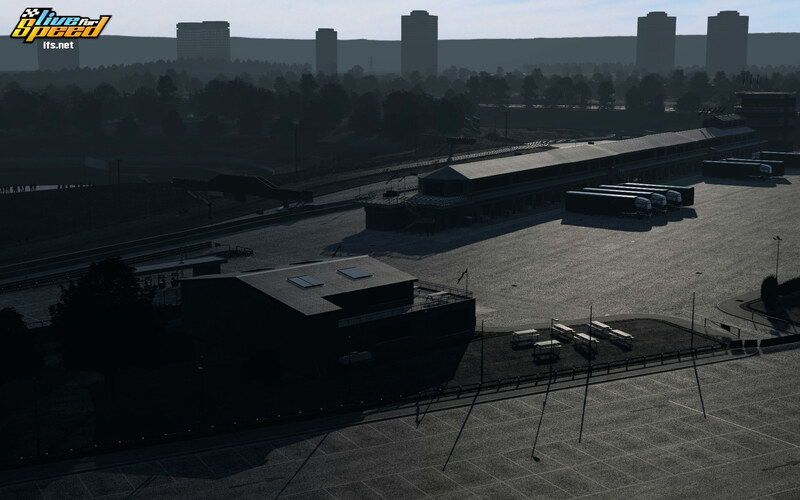 The layouts at Autocross should be compatible, though some of the areas are a few metres wider. So some changes at the edges may be needed. At Aston there are quite a few adjustments, various corners have been improved, tightened up a bit in some cases, but most things are pretty much in the same place so I believe most layouts should work with a few adjustments. I think I should be able to make old Aston layouts load with the extra 2 metres added automatically. Quote from Scawen : Usually the specular reflections are not coloured. So I suppose that is a specular workflow though I'm not really sure about the terminology. Currently we do not have control of specular colour per pixel. A specular colour can be set for a whole surface and that can be used for a metallic effect (or another kind of coloured reflection, for example a window covered with a film of coloured transparent plastic). Basically, a metallic workflow is when an arstist has a control over roughness (or smoothness) and metalness. A specular workflow is when the artist has control over smoothness/roughness and specular color directly. In a specular workflow (like you did right now), if an artist wants to do a similar effect, he needs the control over the specular color per pixel, or have control of metalness per material. Quote from Scawen : I'm not really sure what a specular factor or a specular power is, but the BRDF naturally reduces the brightness of the shine and increases the spread if the roughness is increased. Okay nice, that means that the specular is normalized. Quote from Scawen : Our shaders are using an approximation to a Cook Torrance BRDF with optimisations discussed by various authors. After quite a bit of experimentation we came to one that Eric was happy with and felt he had enough control over to get most of the effects he needed. Quote from Scawen : I was forced to implement fog in the shaders when I needed to move to shader model 3 and it doesn't do fog otherwise. So I went for exponential fog. It's nice because it allows fog to have some effect in the middle distance without reducing far distance pixels to 100% fog colour. The screens hors are looking great. I hope the long grass will not pass through the car floor.